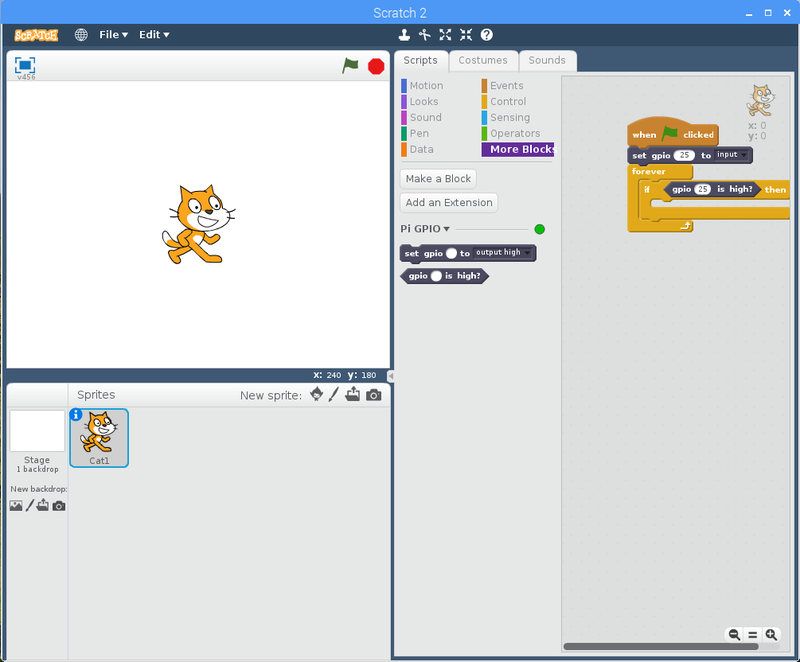 Using a button control a sprite within Scratch 2 and then to turn an LED on and off. A resistor is an electrical component that has a specific value of resistance measured in ohms. Resistors are used to restrict the amount of current in a circuit or facilitate a drop in voltage. 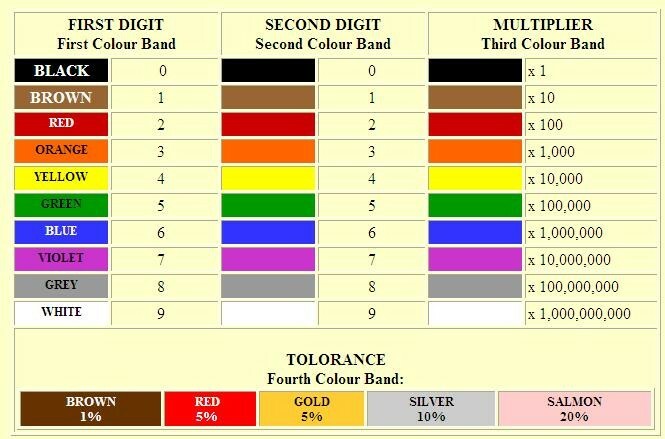 Its value of resistance can be read in ohms using the colored bands on the body of the resistor. An LED is a light emitting diode. Diode’s are a class of electronic components that are designed to only allow current to pass through them in one direction. This means that LEDs are polar meaning they have an anode (positive) and a cathode (negative). Current must flow into the anode and the cathode must be attached to ground. 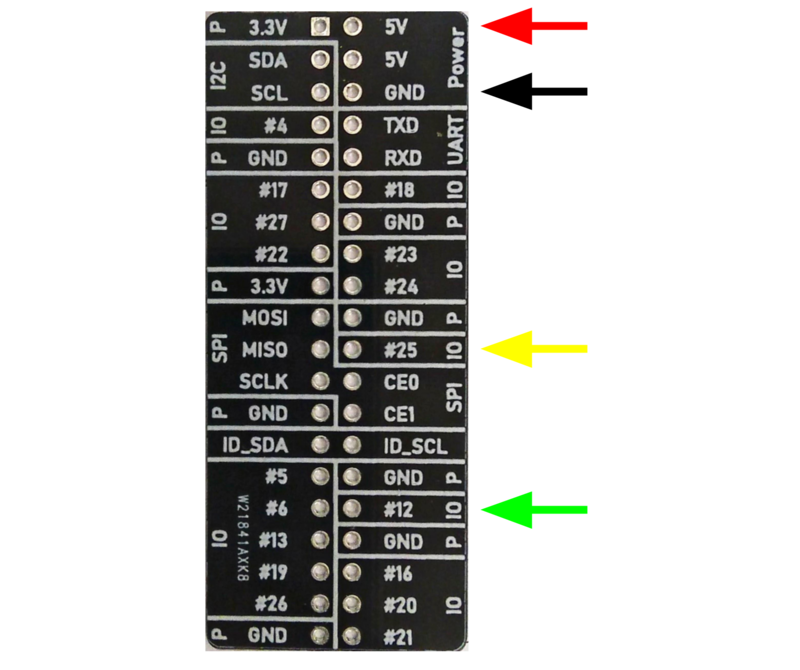 When placing the button in the breadboard make sure that the pins are securely placed, it can be difficult. Also note that the kinked leg of the LED in the diagram refers to the anode (positive) pin. 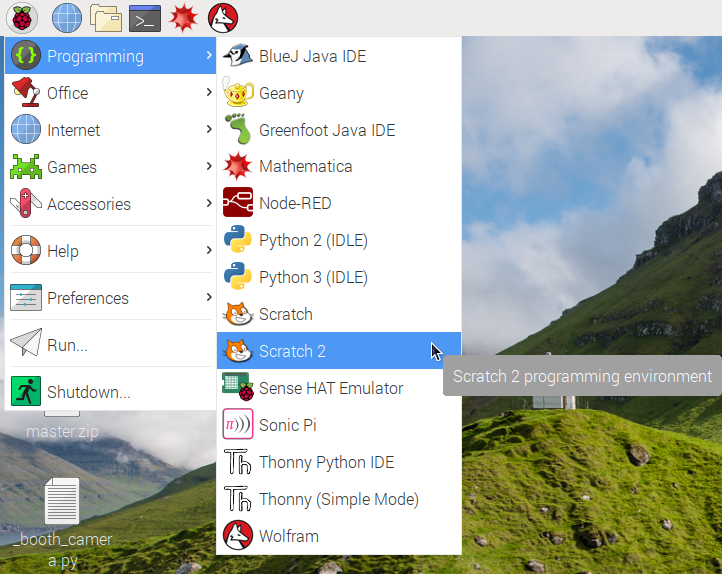 Click on the Raspberry Pi icon in the upper left corner of the screen, click on Programming look for the cat icon and then click on Scratch 2. 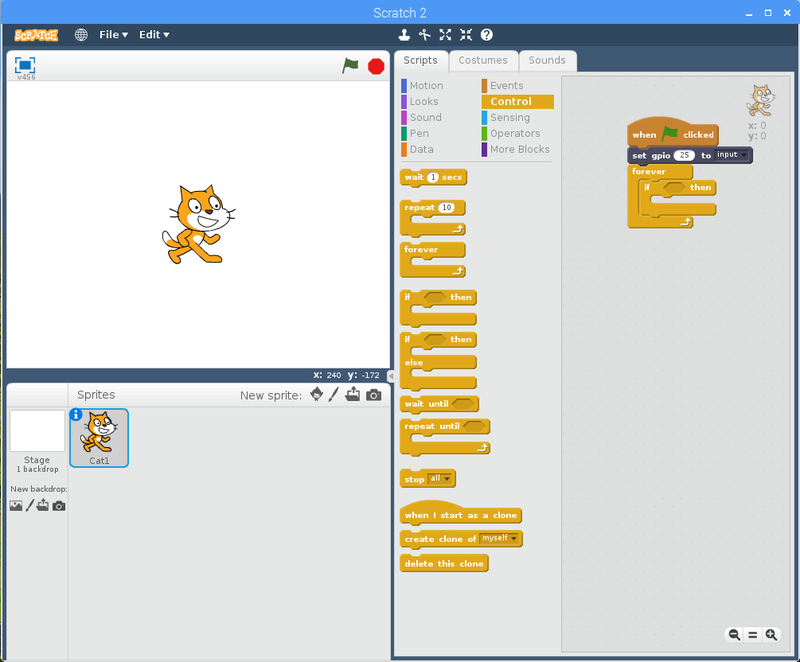 Once the Scratch 2 window opens click on More Block and then Add an extension. 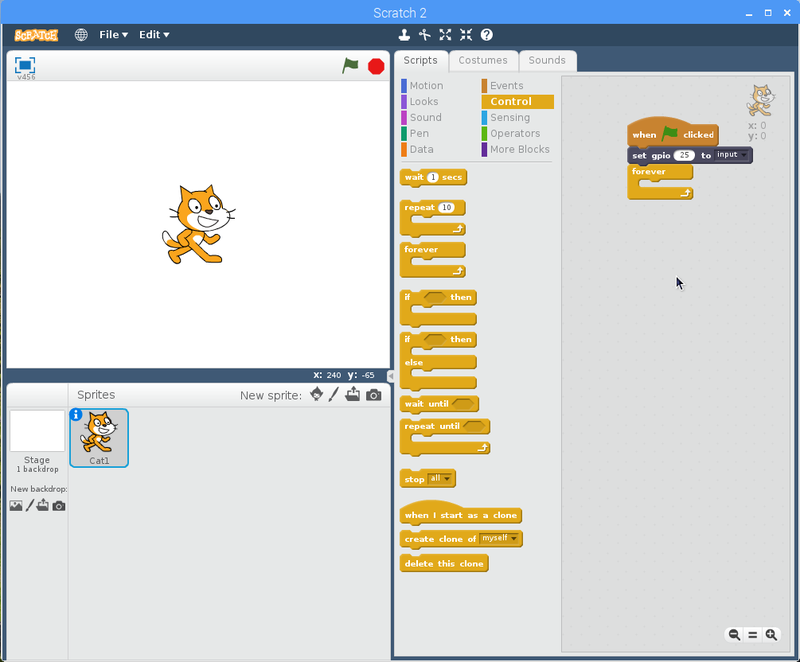 Click on Pi GPIO to select it and then click on OK.
Now that we’ve added the blocks we need to communicate with the GPIO, Click on the Events tab and drag the “When flag clicked” block into the block area on the right hand side of the window. 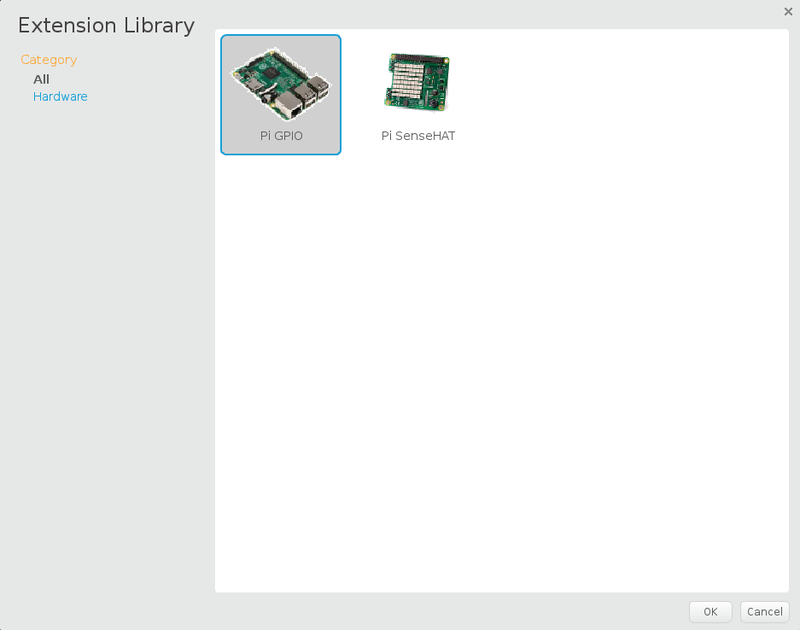 Click on the More Blocks tab and “set gpio __ to __” blocks to the “when flag clicked” block. Fill in the blanks with 25 to input. Next click on the Control tab and add a “forever” block to the bottom of the program. Staying within the Control tab place an “if __ then” block inside of the “forever” block. 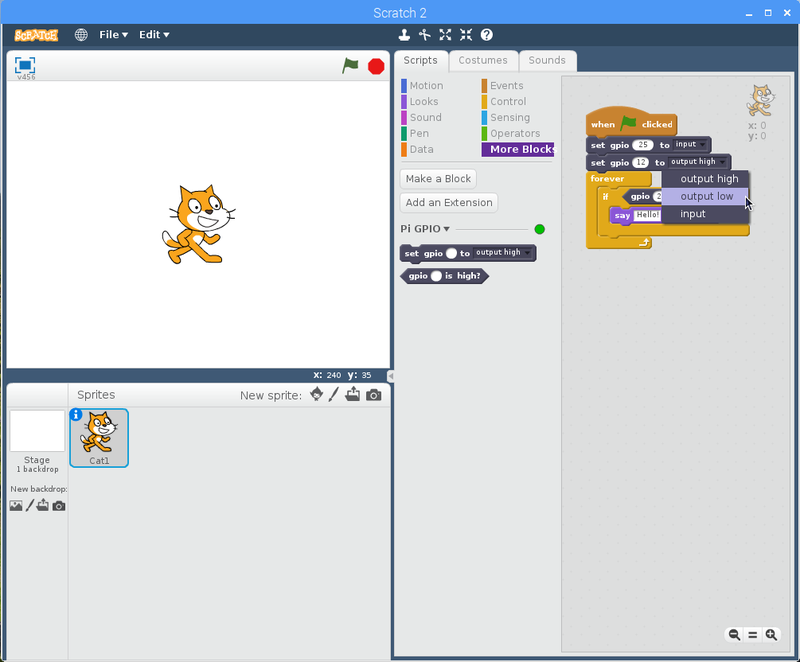 Next click on the More Blocks tab, place the “gpio __ is high?” block inside the “if __ then” block (place the left edge inside the hexagon). Fill in the blank with 25. Click on the Looks tab and place the “say Hello! For 2 seconds” block into the body of the “if __ then” block. 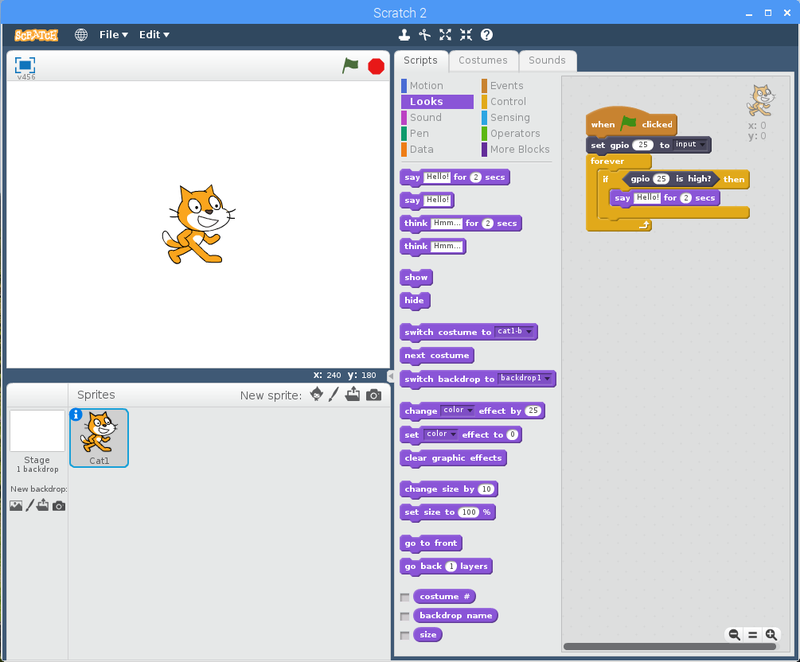 This is now a complete program, if you click on the green flag to start it, when you press the button on your breadboard the sprite will say “hello” for two seconds. Now let’s also control the LED with the button as well. 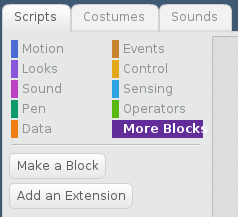 Click on the More Blocks tab and drag a “set gpio __ to __” block above the “forever” block. Fill in the blanks with 12 and output low. This ensures that the LED will be off when the program starts. 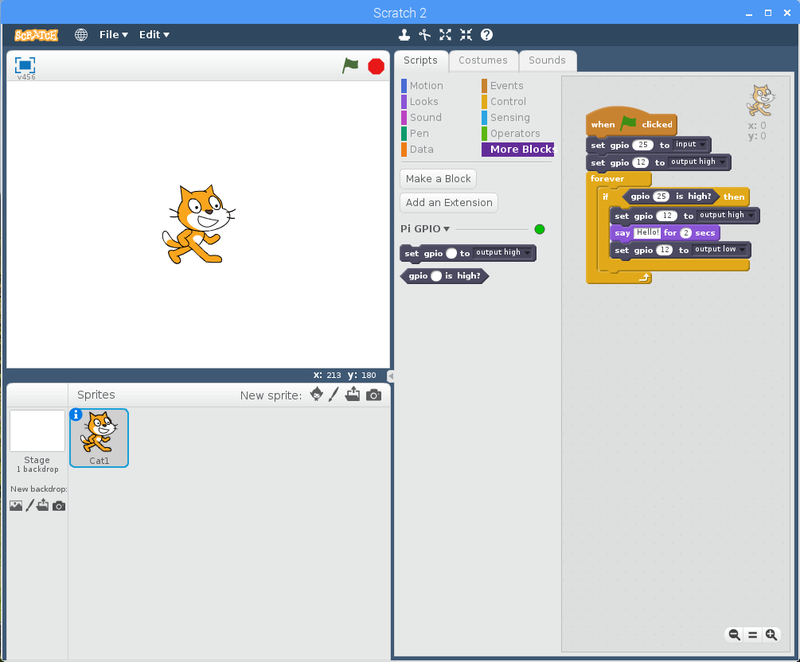 Place a “set gpio __ to __” block before the “say Hello! For 2 seconds” block and one directly after. In the first block fill in 12 and output high, in the second block fill in 12 and output low. 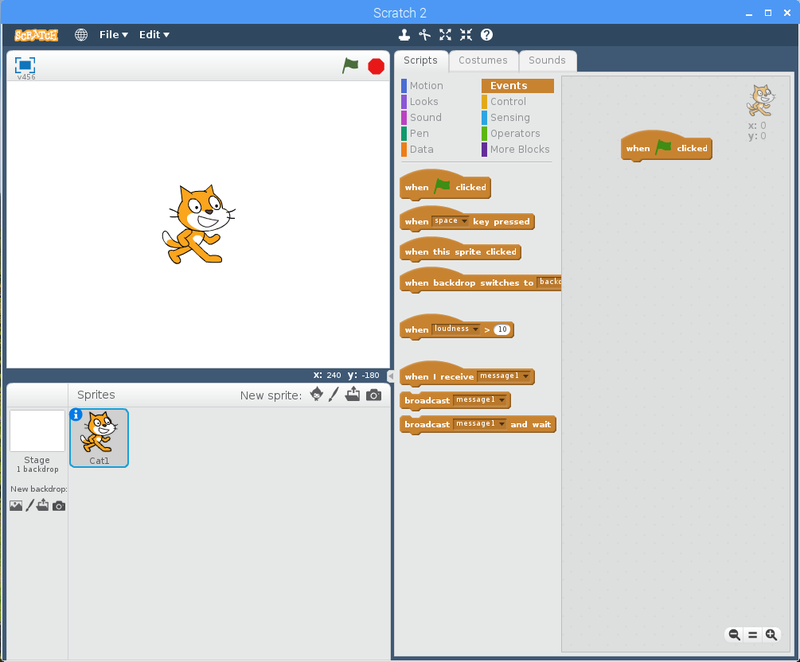 Now if you activate your program by clicking the flag, the button should activate both the sprite and blink the LED. Can you change the duration of the hello message and LED activation? Can you make the LED blink a second time per button activation? 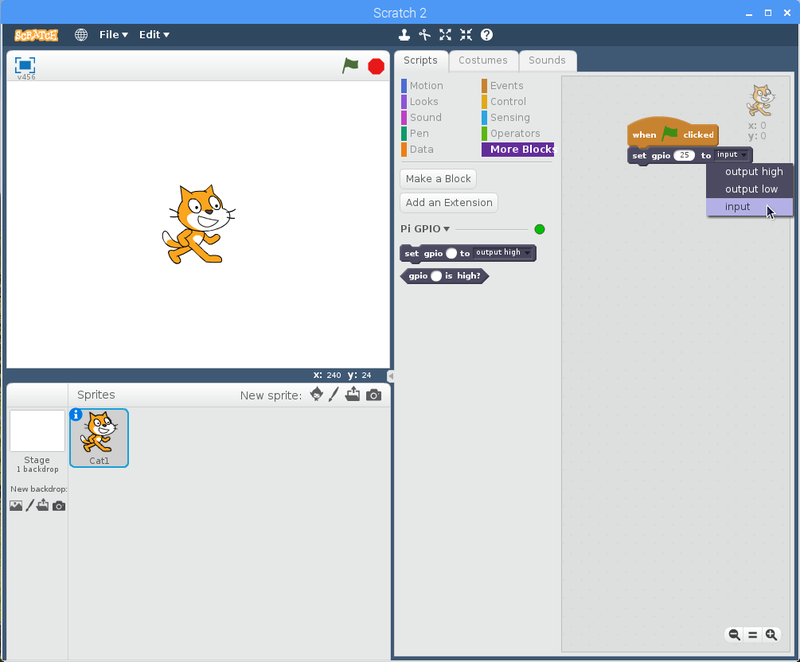 Posted in Raspberry Pi, Scratch 2.